FREE ESTIMATE. To buy, auction, sell or consign your Liberty Bell 7 space flown dime that is for sale, please email Nate@NateDSanders.com or call the Nate D. Sanders Auction House (http://www.NateDSanders.com) office at (310) 440-2982. 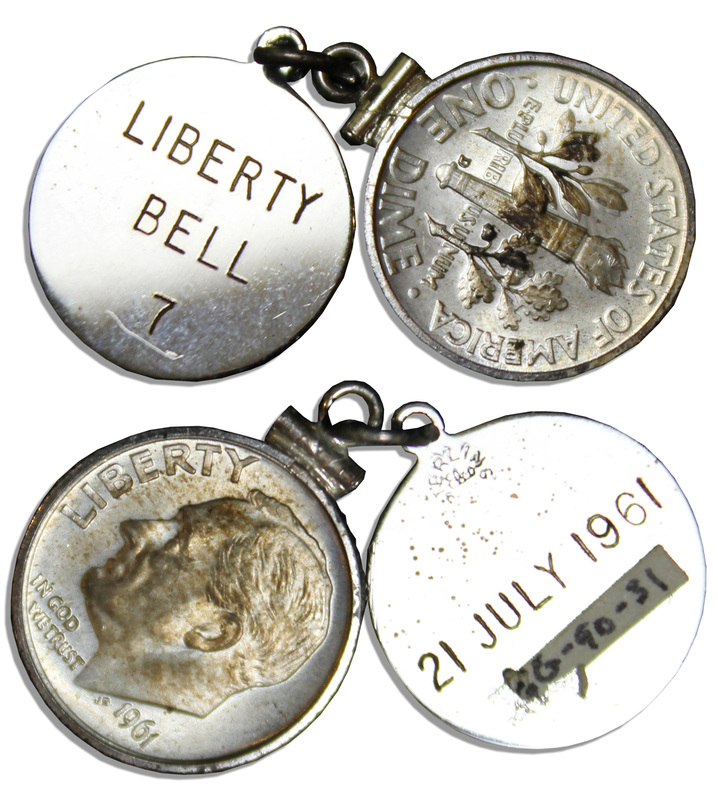 Top dollar obtained for your Liberty Bell 7 space flown dime or other space flown memorabilia. The Liberty Bell 7 is the nickname Gus Grissom coined for the Mercury Capsule #11. The shuttle was used for the Mercury Redstone 4 flight in 1961, which was the second American flight in space with humans on board. Memorabilia that has flown in space is very sought after by astronomy memorabilia collectors. We sold a Liberty Bell 7 Space flown dime at auction for $3,049, and would be able to get you the highest prices for your space flown items. Item details are below. Space flown dime from the Mercury-Redstone 4 mission. Dime was flown with Gus Grissom aboard the Liberty Bell 7, which launched from Cape Canaveral on 21 July of 1961. Flown dime, minted in 1961, comes with a sterling silver medallion engraved with the launch date and mission title. Both are affixed to a metal loop for hanging on a necklace chain. Paper tape affixed to the medallion reads, ”66-90-31”. Some tarnishing, else near fine. From the personal estate of Gus Grissom and with an LOA from his son. Sold for $3,049. Liberty Bell 7 Space flown dime. Click to enlarge. Liberty Bell 7 Space flown dime LOA. Click to enlarge. FREE ESTIMATE. 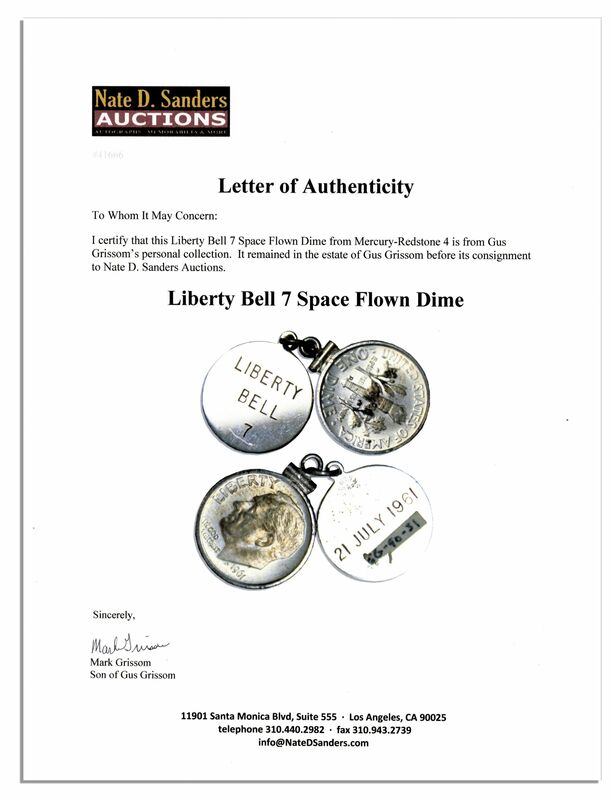 To buy, auction, sell or consign your Liberty Bell 7 space flown dime that is for sale, please email Nate@NateDSanders.com or call the Nate D. Sanders Auction House (http://www.NateDSanders.com) office at (310) 440-2982. Please let us know if you have space flown memorabilia for sale.